Carter Subaru Ballard proudly serves the Seattle, WA community with cutting-edge Subaru service and maintenance and our hassle-free Subaru experience. Subaru vehicles are well-known for dependability and durability--you can get even more out of your Subaru with state-of-the-art Subaru service performed by factory trained technicians at Carter Subaru Ballard. Take advantage of huge savings with our Subaru service offers and deals on Genuine Subaru Parts and accessories to make maintaining your stalwart Subaru easier. While we work on your vehicle, check out the latest innovations with our new Subaru showroom and selection of certified pre-owned vehicles. 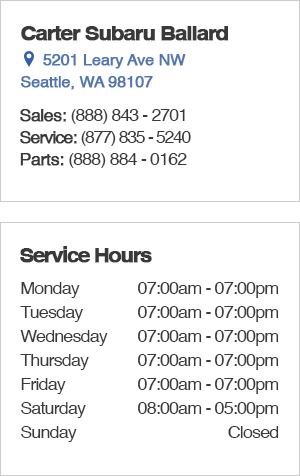 Contact us at (877) 835-5240 to schedule your service appointment and visit us at 5201 Leary Ave. NW, Seattle, WA 98107, near West Seattle and Redmond, WA. We can't wait to serve you at Carter Subaru Ballard! -I-5 northbound - Take Exit 167 on the left for Mercer Street toward Seattle Center. -LEFT at the stoplight (Valley St), move to the far right lane. -RIGHT at the second stoplight (Westlake Ave N), Lake Union should be on your right. -Follow Westlake and stay in the right lane and take the Fremont Bridge to the right. -After crossing the draw-span of the bridge take a LEFT at the second stoplight (Fremont Place). Follow Freemont place for aprox. 1.5 miles which will turn into Leary Ave. After going under the Ballard bridge the road will bend to the right and Carter Subaru Ballard will be on your left in a couple blocks.